I talked about Damariscotta in my last post. This time, I'll be talking about Cecchetti. Most of my designs are either inspired by a detail I've seen around which I build a garment or they are an interpretation of a theme or idea someone has proposed. In this case, Cecchetti may somewhat fit the former category but in many ways it's an interpretation of a sort of nostalgia I feel for things that aren't so much a part of my life these days. Along with the subtle drape at the neck (for which I provide notes in the pattern for modifying it to be more or less draped) I also tried to capture the aesthetic of the warmup clothes my classmates and I used to wear when I (long ago) took ballet lessons. I was amazed at how overly long sleeves and leg-warmers, would make one's extensions and arm placements look even longer and more graceful. 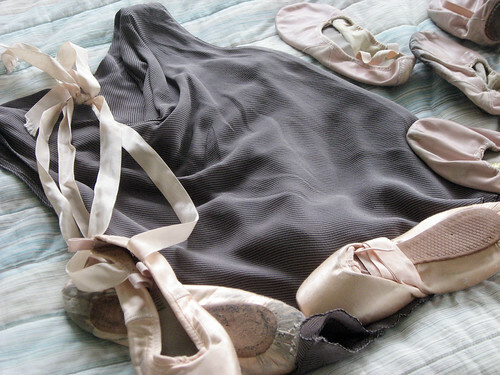 Cecchetti has a little more ease than those pieces I used to wear, and the soft, decadent silk and merino yarn is surely not meant for sweating and leaping, but the vertical body darts, sleeves that slip past the base of the hands and the hip length all serve to elongate and flatter the body. 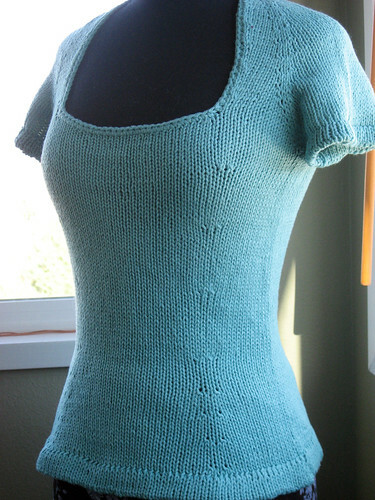 I think that people who knit this piece will find it very comfortable as well as flattering and very easy to modify as you go to get a good custom fit. 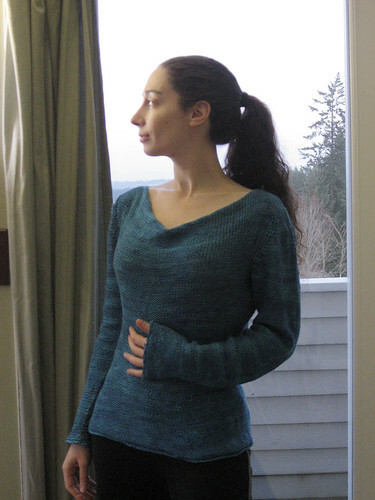 As with most of my designs, it's knit seamlessly in the round, including the set in sleeves. And do not worry about it being all in reverse stockinette, the instructions allow you to knit it either right side (purl side) out or wrong side (knit side) out. Check out Cecchetti or any of the other beautiful Spring and Summer pieces over at Twist Collective. The Spring/Summer 2010 Twist Collective is up and it's visually stunning and filled with amazing designs. I was lucky enough to have two submissions accepted and will do a blog post for each. The first piece is Damariscotta. Named for a hard to pronounce but lovely little town in Maine, near where my dad's family has land. 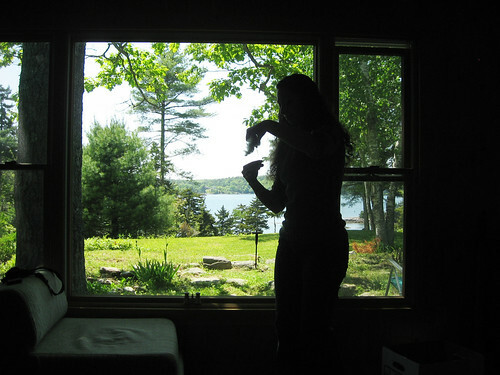 I'll sometimes fly out to Maine to go to the Fiber Frolic with my mom, and we'll all stay at a little cabin that my dad built on the land there. Having grown up in New England and having spent plenty of time in Maine, I associate the area with a love for the ocean, a rather pragmatic sensibility and clean and structural design. I strove to capture those qualities in this top. The piece is knit from the top down with instructions for an entirely seamless construction, right down to the double-knit hems that are grafted closed. I've also included instructions for people who might run at the sight of the words "graft" or "double-knit" so don't despair if that's not your cup of tea. I also think this piece would be magnificent with a simple lace border around the hem and sleeves, instead of a finished hem shown. A wee bit of single crochet would prevent any curling and it would turn this simple piece into something worthy of a pretty pencil skirt and heels. 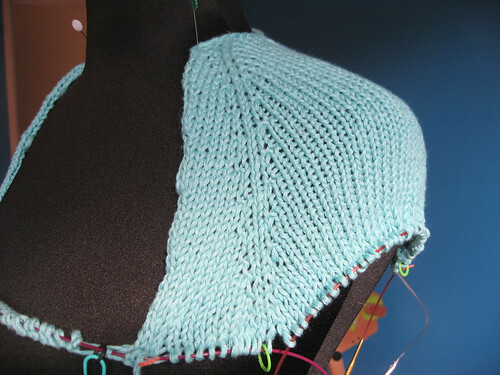 While I love the idea of a deep angled square neck (image it over a pretty little lace tank,) I knew that wouldn't suit everyone and that is why I chose the top-down construction instead of my preferred method of knitting bottom up. Keeping in mind that the single crochet will pull in the neck a little, one can simply throw the live stitches onto waste yarn and try the piece on to determine the most comfortable and flattering neckline depth and width. 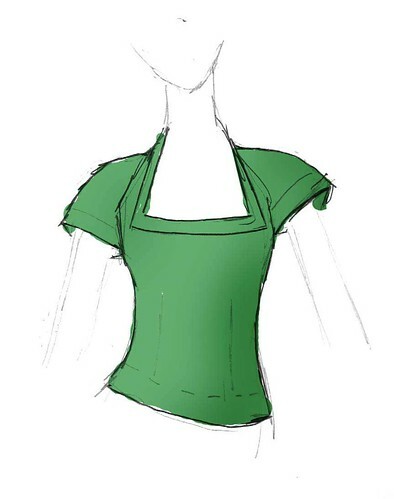 Once you work the neckline you like best, you can shape the torso to follow every curve or leave out the shaping altogether for a more relaxed fit. 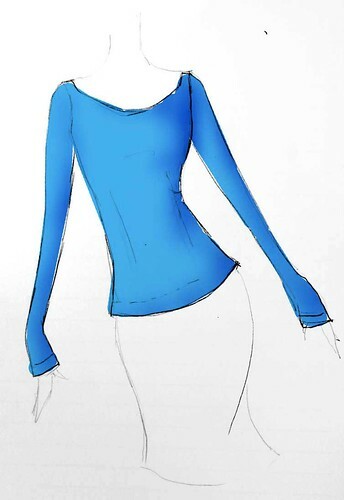 The sleeves can be worked the same way, and can easily be lengthened to fit your climate and preference. So that's Damariscotta for you. I hope that those of you who like the design will enjoy knitting it, and if it's not your style, I have no doubt there's another piece in this edition that will catch your eye. Check out this and all the other beautiful patterns in the Spring/Summer 2010 edition of Twist Collective, by going here. August 9-14, in beautiful Stirling, Scotland, is UK Knit Camp 2010 and I have been asked to teach there. A tutor had to drop out and the good folks at British Yarns asked if I'd be willing to put something together. I couldn't be more excited. The list of tutors is amazing and varied, offering a huge assortment of classes for almost any interest. My only regret is that I won't be able to take any of those classes. You can check out the details of my courses here. The first class is in MS Office for pattern writing, where I'll cover topics I've discussed in my Excel tutorials plus some extra tips and tricks including wrangling all that information in Word. If you like hands-on learning, instead of just reading things on a screen, I think this class will be a great pick for you. Since classes are held on a university campus, we'll have access to classrooms with computer workstations so everyone can follow along. I'll also be covering the use of Adobe products for pattern creation, including my Illustrator tutorials on chart and schematic making. For people who have access to these applications at home or an ability to apply skills learned with Adobe products, to an open source alternative, I think this will be a fun class and I hope to be able to cover some extra tips and tricks including some InDesign skills, in the class. 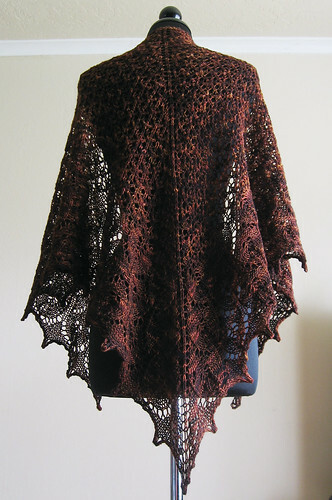 We'll discuss the basics of knitting a triangular shawl, how to read the charts and relate them to the work in our hands (ie, "read your work") and how to make the piece bigger or smaller based on whatever yarn and yardage you have on hand. I really hope that I'll see some of you in Scotland and I'm looking forward to organizing my lesson plan and classroom handouts for the event. A quick post to let you know that I recently did an interview with Robin Hunter on being a professional designer. It was a great exercise to think about my process in a really conscious way. A lot of what I do now has slowly evolved over time and it's encouraging to realize how far I've come but also know I have plenty farther to go. Please check out all her weekly interviews. I am clearly in fantastic company on her blog. And, if you feel so inclined, leave her a comment or two. I'm surprised how few she has and her posts are so interesting. 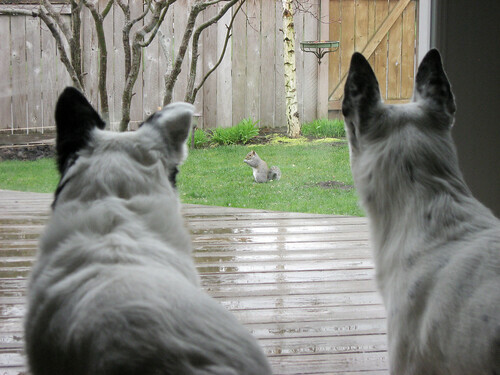 A fat squirrel on our patchy but quite green lawn. The girls are not fans. 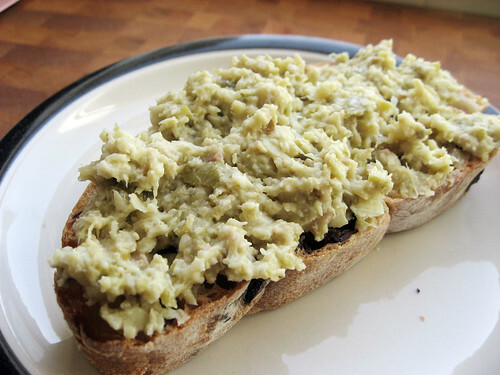 Yummy green olives, capers and artichoke hearts combined to make a delicious spread. Check click the image for a link to the recipe. 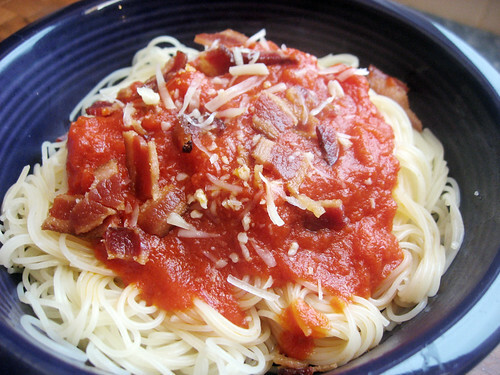 Not green, but a recipe recommended by the same site, is a buttery tomato sauce I've garnished with bacon. Mmmm, bacon. 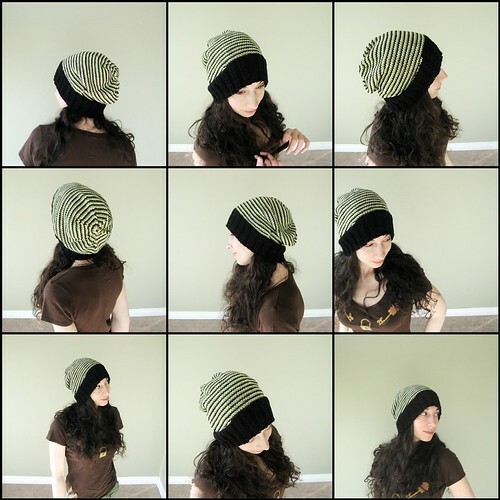 And lastly a quick little spiral striped (jog free, baby!) hat in soft superwash merino left over from another design. I'm thinking I may rip the ribbing and rework it a little tighter (but not too much so) just to make sure it holds up to some wind. I wanted something loose and slouchy and not inclined to give me terrible hat head. I could sleep in this thing, it's so comfortable.